If you're looking for a review of the PetSafe Drinkwell Platinum Pet Fountain then you're probably aware just how important water is to cats. Most cats, in general, don't tend to drink enough water and dehydration is a serious issue in cats. Often cats struggle to realise when they're dehydrated, unlike us humans. This is, of course, where the problem ​arises. What is a Drinkwell Platinum Pet Fountain? Whats the Drinkwell Platinum Pet Fountain Like? According to petMD, the average cat needs 1 ounce/28ml of water per pound of body weight. If for example, your cat weights 9lbs/4kg then they will need 8 ounces/227ml of water per day, which is roughly an average sized cup. Obviously, this is a rough estimate as there are quite a few variables to consider. Your cat may be larger or smaller and may be more or less active than the example above, however it's a good measuring stick. The other thing you need to consider is how much wet food your cat eats. Wet found contains a large amount of water and therefore if your cat eats a lot of wet food then they will generally require less water. If your cat eats a mainly dry food diet then they will most likely require more water. The way I see it, as with humans the more water we get the better. If there's any tool out there that can make our cats drink more water and be healthier, as a result, it's surely a great idea, right? As a fellow cat owner, you've probably noticed that cats can be very stubborn and fussy at times. A lot of cats don't like drinking water from a bowl that's near to their food or if the water bowl hasn't been cleaned out that day. I know with my own Persian cat Milo he generally prefers to drink water when it's running from a tap rather than drinking from a bowl. My other cat Teddy who's a British shorthair doesn't drink much water so he's the perfect test for the Drinkwell Pet Fountain and to establish if it actually increases his desire to drink more water. The Drinkwell Platinum Pet Fountain is a cat water fountain that supplies clean filtered water for your cat. Featuring a huge 5L water storage tank this makes this product ideal for multi cat households. Cats prefer to drink water from moving sources due to their natural instinct and this is where the Drinkwell Platinum comes in. With its large bowl and constant flow of water, the Drinkwell should encourage your cat to drink more water and provide you with a low maintenance solution. The Drinkwell cat water fountain was simple and easy to set up and assemble. It is just a case of lifting the plastic casing off to ensure that the intake tube is inserted into the pump and then clipping this back on and filling the water compartment up. The instruction manual has a step by step guide helping you walk through this. PetSafe recommends that you rinse the charcoal filter through water first before putting this in the water fountain to remove any loose dust (which is harmless). Once you have done this then it's just a case of plugging the water fountain up. The process probably takes less than 5 minutes and then you're ready to go. I've been using the Drinkwell water fountain now for a few days and instantly both my cats were intrigued by the unit. As you can see from the image above Milo was excited about the water fountain and was watching me set it up. It was almost like he knew it was something for him to use! As soon as I put water fountain out and filled it up with water both my cats radiated towards it and started dipping their paws in the bowl and pawing at the fountain. You'll be able to see a video I recorded of the whole process further down this post. 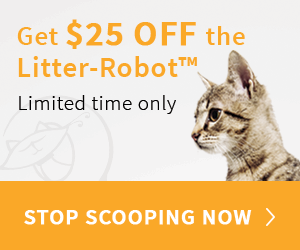 I recently reviewed the PetSafe ScoopFree automatic litter box and noted that it took my cats a good few days to adapt to it. This wasn't the case with the Drinkwell cat water fountain, Milo was instantly drinking from the fountain and Teddy was also. I've noticed that because of the water moving that the cats are more interested in playing with the water and then drinking as well. Although it's only been a few days of use I'm sure they're drinking more water than before because I can tell by how much water has been used from the 5L tank and it looks like twice as much as I would normally use with their water bowls. I must say I'm impressed! I saw quite a few reviews online and as with most products online, most of these reviews are from people who don't own or haven't owned the product so they can't really give a fair overview of the product. Some people were saying the motor was very quiet others were saying that the motor wasn't very quiet. The noise of the motor really depends on how much water is flowing, you can control the speed of the flow and you can hear the motor but it's very quiet in my opinion and you really have to listen carefully to hear it. It certainly isn't intrusive, I'd recommend putting a mat under the water fountain to catch any drips from your cat and this will also reduce any slight vibration you may hear through tiled or laminate flooring. There are, of course, some disadvantages with the Drinkwell Platinum water fountain (but not many). The main downside would be the ongoing costs to replace the charcoal filters which need replacing every 2-4 weeks according to PetSafe. These aren't a massive cost but it's something worth considering as the fountain will need them replacing often to maintain its effectiveness. The other downside would be the cleaning process that's required every week according to PetSafe. Although the water fountain is dishwasher friendly there are some small parts that require manually cleaning such as the pump. Drinkwell has a special cleaning kit which is designed to get into the tight areas such as the water tank. You'll struggle to clean this out properly without these tools. The cleaning kit isn't a large expense so it's something that certainly wouldn't put me off the product. I recording a full video review that you can view below. The PetSafe Drinkwell Platinum Pet Fountain is without a doubt one of the best cat water fountains on the market. Most of its rivals fall short in one way or another, mainly in terms of water storage with most offering a smaller storage. This product will make life cat ownership a little easier and combined with a self cleaning litter box gives you a pretty automated solution if you want to go away for a long weekend and leave your cats at home. It's also reassuring to know that this one product can vastly improve your cat's health and well-being with the higher water intake. Something else I like is the 2-year warranty which is more generous than some of the other suppliers out there. You can be assured that your backed up should the worst happen and your product stops working after a year or so. Isn't it ironic that when you buy a product and it breaks it always seems to be around the 12-month mark when the warranty runs out? Overall an excellent product that represents great value for money in my opinion.